June 30th it is – the start of an 18 week program of training to prep for the nyc marathon. in case you missed it – i’m running with the ny flyers these days, and they have hired out the runsmart program – which i’m about to embark on. it’s going to be a challenge – this whole philosophy of the minimum amount of effort/maximum results. i gave it a go on saturday, just to see how it felt. according to my “vdot” – (which i really don’t understand – but once i really get it, i’ll explain it here)… i should be running my easy runs at a 10:30 – 11:30 pace. WHAT? seriously, i feel like i could walk at that pace. i ran an “easy” 5 mile loop in central park – consciously tried to slow it down – which i did – and ended up at a 9:40mm. when i finished that run, i felt like i could go another 10 miles. is that what it’s all about? all i know is that according to the plan, i need to slow it down even more. it takes more concentration, and is much harder to really slow your pace down than to speed it up. 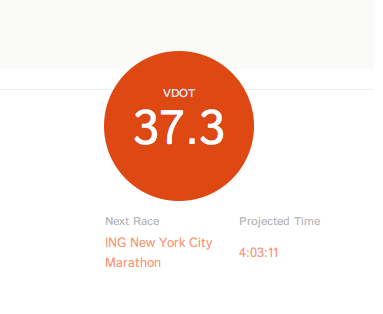 in case you’re wondering – my “vdot” says i will finish the marathon in 4 hour and 3 minutes. in my mind – i was thinking more like 4 hours 15 minutes. but now that i see that number – of course, of course – i want to run it under 4.